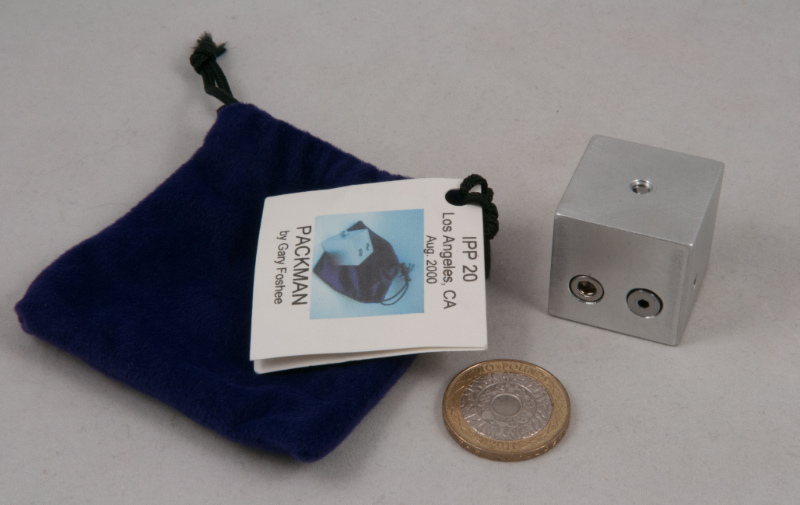 A cool cultural reference and the puzzle’s goal encapsulated in a simple name – Pac(k)Man is another neat little aluminium puzzle from Gary Foshee’s workshop. It comes in one of his customary purple velvet drawstring bags and it’s most definitely pocket-sized. 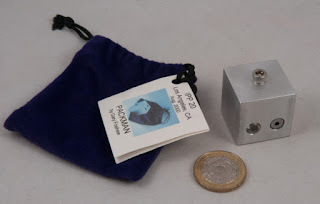 In its unsolved state it has a large screw-head protruding outside of the little aluminium cube and you’re told that your goal is to get everything either inside the cube or at least flush with the sides. The projecting screw-head is nicely knurled, making it pretty easy to unscrew it with just your digits. There’s an obvious place to put this screw, except that it’s pretty clear that there’s something blocking the hole so the screw can’t get all the way home, leaving it projecting a bit. Well it was never going to be that simple, was it?! OK, so what else have we got? Well there’s another screw in there, but it’s flush with the surface and unless you have Chris’ weird fingers, you’re going to need a tool to get that one out… it needs a hex wrench… but you don’t seem to have one… examining things a bit more and you’ll see that there’s an exit hole for what appears to be the goodie partially blocking the screw hole you want to use for the big screw…except it’s being held in place by that flush little hex-headed screw… so where is that hex tool? Depending on how you approach these things it might only take you a couple of seconds, or it may take quite a while, but when you find it you’ll grin a bit… that lets you make a little more progress but pretty soon you’ll find yourself stumped again – and I really loved this second little brick wall that you hit – you think it’s all plain sailing from there only to find another road-block that requires an altogether different approach to problem-solving! 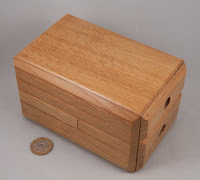 The Oak Wood Slide Box definitely wasn’t the first Puzzlebox that Robert Yarger produced, but it was the first design that was given a number and signified intent to keep them coming… so from that perspective it’s an important puzzle in the canon. On the outside it looks reasonably modest – a simple little chest of drawers without any fussy decoration – or indeed any way to open the drawers that are all rather securely locked in place. The ends of the drawers seem to have finger holes in them, but they don’t seem overly useful, yet. Examine the box closely and you’ll find a few interesting features, that will in turn lead to another that’s hidden away inside – find what it does and you might find a drawer unexpectedly popping open… and you’ll see that Rob’s gone to town on making the insides pretty – lining the drawers with green crushed velvet – nice touch. From there you need to experiment a little to find how to get into drawer number two, but given you’ve got this far, it probably won’t take you very long to find your way into number two. 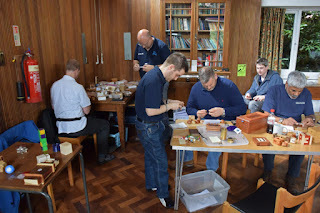 …at this point you might be reasonably satisfied with your progress, but you’ll probably notice that you haven’t used about half of the available space in there so you might just be suspecting that there’s more to be found, and you wouldn’t be wrong… getting into it is a little trickier though. 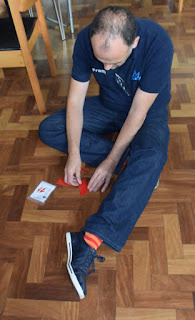 I spent quite a while trying to imagine how the heck Rob has achieved what he has using the bits that interact to get them to behave the way they do… and then gave up. Clearly he has used some of Terry Pratchett’s practical magic inside there to get things to perform different functions. For me, this is the start of the series (yes I know there were others before that, heck I even have some of them in my collection!) 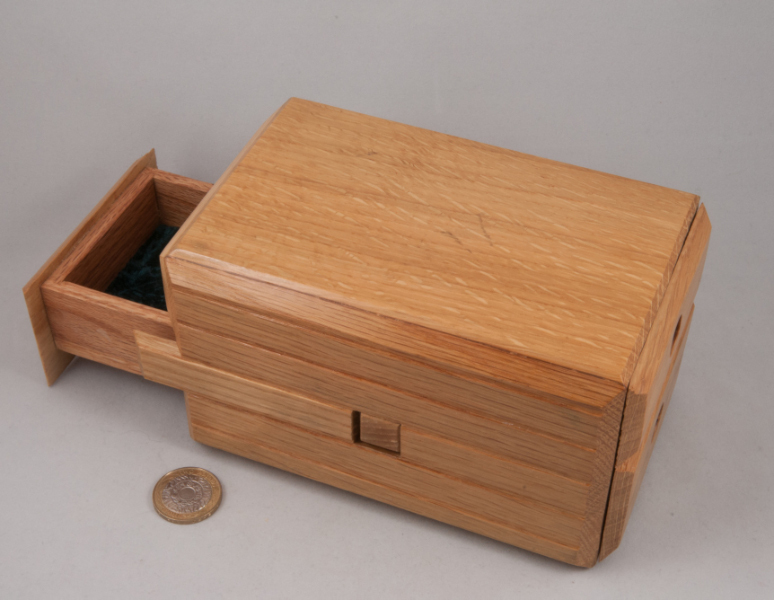 and that makes it a little bit special… it also just happens to be a really nice puzzle too! MPP19 started a day early for me with the arrival of Marc in the afternoon (after a quick fight from San Jose!) and Louis in the evening (after a short hop across the channel from Schipol). We started the weekend as we intended to continue, and settled into a couple of hours puzzling before I called it a night and left the two of them to puzzle into the small hours. 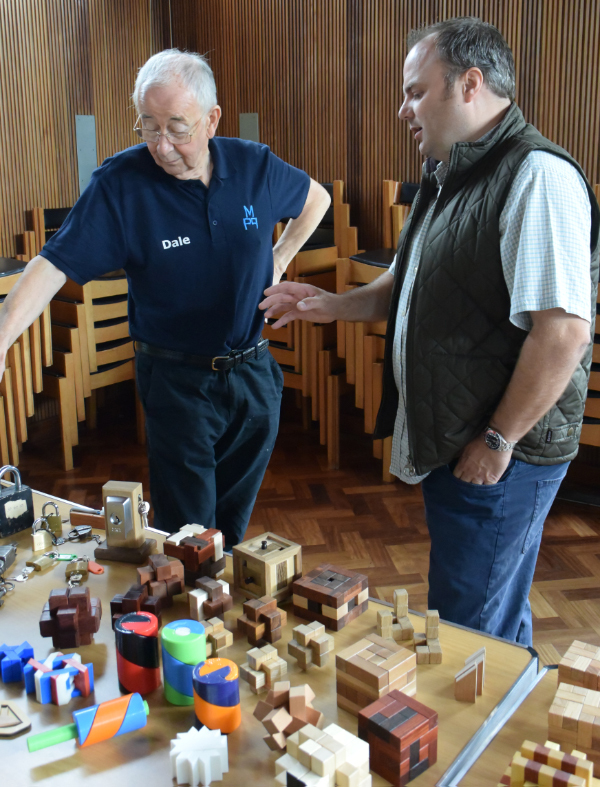 After a quick breakfast the next morning, we put some puzzles in crates and headed down to the village hall where we found Oskar and Jose had already set up shop displaying Oskar’s recent developments and some old favourites. 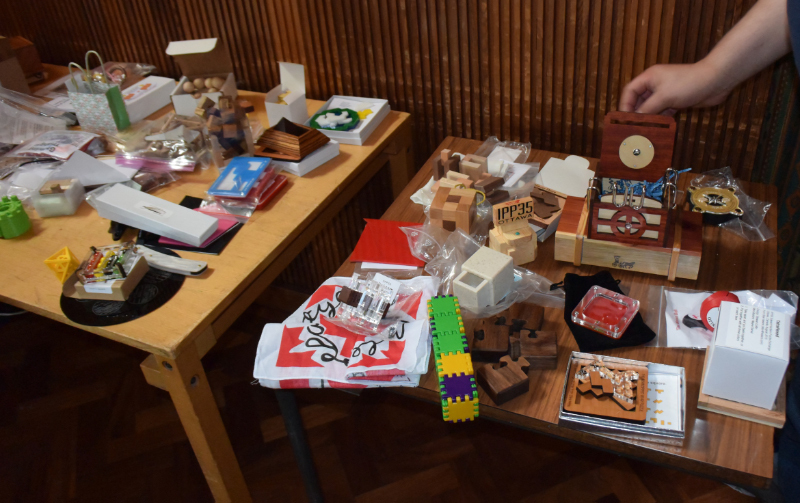 We said our hellos and set about bringing tables into the hall just in time for the arriving puzzlers to lay out their latest treasures. 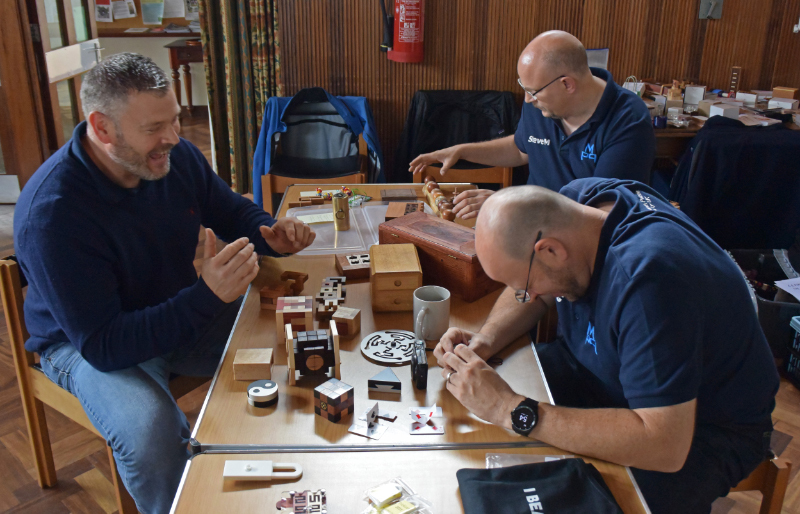 It didn’t take long for around 20 mainly-blue-shirted puzzlers to assemble and lay out piles of puzzles, grab a cup of coffee and settle down to some good banter, gentle kibitzing and a goodly dose of puzzling. Oskar had brought along a bunch of new-ish designs for sale and for demonstration. 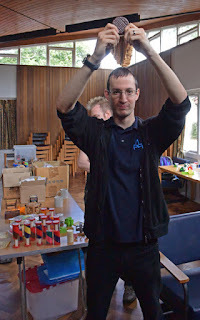 Along with the obligatory twisty puzzles (all well beyond my abilities!) 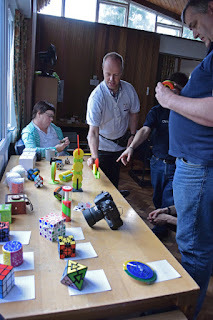 he also had a number of rather interesting gear mechanisms – from a self-balancing stack of gears that rolled back and forth on a track, to balancing gears for a clock mechanism. The one that really caught my eye was a Golden Ratio gear set… where the ratio between the one cog and another was the Golden Ratio Phi… at this point your head ought to be exploding because the whole thing with a pair of gears is that the relationship between them should really be a rational number (i.e. 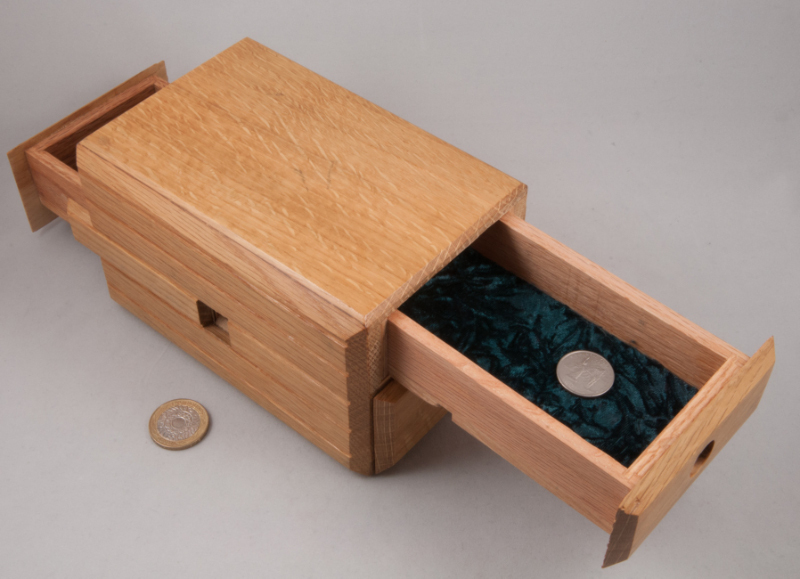 expressible as a fraction of whole numbers) – except the Golden Ratio isn’t… yet this purveyor of black magic has found a way to not only conceive, but also to physically manufacture (with Shapeways’ help) a real live example of one…more than just a little mind blowing. 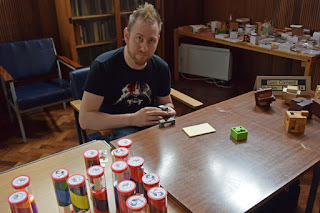 Oli had brought along a bunch of marked decks and proceeded to demonstrate his general prescience by telling us what cards we had in our hands – a feat I was able to duplicate by heroically looking at the other side of the playing cards in question. 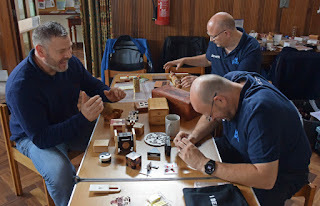 Several folks had a bash at trying to work out the various marking schemes with Louis cracking most, if not all of them, and I had to have the simplest one explained to me… it seems a career in card-sharpery is not in my immediate future. Shane had brought along a few of what he was calling his Interval Puzzles – little puzzles he was been making in between larger puzzling projects… there was a doctored door lock mounted on a stand ("Turn the Plug") that kept me confused for a while before I managed to find a way in, but his wooden block ("Wire Cutter") had me totally confuzzled and confounded and I was relieved when Chris solved it in front of me and put me out of my misery… Shane, they aren’t “interval puzzles” mate, they’re proper puzzles in their own right! Steve Miller had produced a bunch of rather interesting puzzle bolts, some based on one of Ali’s puzzle designs… I managed to solve most of them, and they all managed to put a smile on my face – nice one Steve! 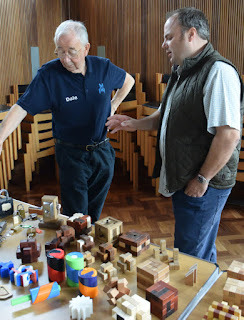 Frank brought along a number of large boxes full of puzzles for sale and ended up giving away some of his funky 3D shape-shifting kits – Thanks Frank! Douglas Cameron joined us for his first visit to MPP from sunny Glasgow (inside joke!) – taking the rather circuitous route of flying from Glasgow to Luton, grabbing the bus from Luton to Milton Keynes and the train to Barnt Green via Birmingham New Street – serious Trains, Planes and Automobiles stuff! 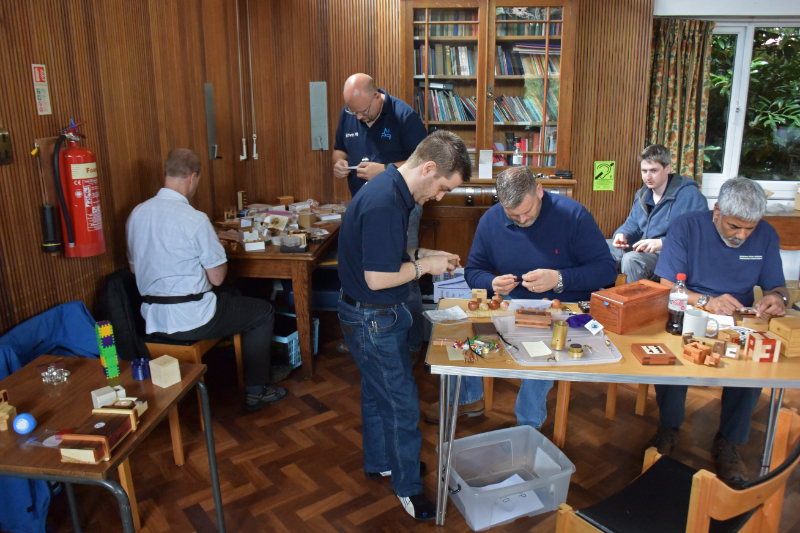 He arrived just about in time for lunch and launched into some puzzling and making new friends, dishing out a fistful of maze pens and buttonhole puzzles along the way – thanks Douglas! Louis brought along a few copies of his 3D printed locks and I suspect that he didn’t leave with any of them as they proved rather popular… as did Steve’s copies of his Ottawa exchange puzzle with several people taking the opportunity to acquire one. People seemed to have a good time so perhaps we’ll do it all again…November anyone?